Is my current belief system serving me? I found the title of this posting while poking around on the net looking to see if it was easy to find information about re-mineralizing your (the human) body. I came across an interview with a dancer (Tonya Kay) that believes strongly in living a raw food lifestyle. The interview came and went, but the (above) words stuck with me. Is my current belief system serving me? Reaches even deeper for I’ve just completed reading through The Biology of Belief by Bruce Lipton. If you’ve got an open mind and open heart, this book will touch you. The best part about it, for me, is that the words have the ring of truth. It may seem funny to you, but you know that feeling when you put on a shirt that you know is just right, and someone comments on it saying that it looks good – and, well, you already knew that? Well, that’s how these words come across to me. The drawback, if you know me you know there is always a critic in me looking to share my opinion, is that the book falls a little short with regards to the external stimuli! The good doctor can talk all day about the stimulus response process, yet he only vaguely touches on the attribute that drives all the cells – light generated by the soul of the person. Yet, I can fully understand any hesitation that he might have in writing about that stimuli for the instruments to measure the interactions are not available and, if they where, by current standards; the act of observing what’s going on would actually change the observation. … Within another ten years, physicists abandoned their belief in a Newtonian, material universe because they had come to realize that the universe is not made of matter suspended in empty space but energy. … In fact, as you focused through the entire structure of the atom, all you would observe is a physical void. The atom has no physical structure – the emperor has no clothes! His way of conveying that atoms are energy waves of a particular vibration makes sense to me. On a quantum scale, I can see how two atoms can find harmony and bond. Like spinning gears, if two atoms have energy signatures that complement each other, like teeth in a gear, the atoms would find the tendency to bond. What I find truly amazing about the quantum level atomic interactions is the amount of empty space that exists! We’ve all seen the artist’s representations of water particles where it shows them floating around in space. This website has a few really nice pictures. The common understanding is that as the water molecules bounce around they create a little space in between each molecule. Well, this understanding seems to be built off the idea that the atoms are ‘solid’ balls of matter. Well, if they are a vortex of energy, I can imagine them bouncing around due to electromagnetic forces that would create attractive and repulsive forces like millions of super strong magnets spinning super fast. These little magnets are so strong that two molecules can’t touch – they can hold (what seems to be) a lot of weight – yet, there is still an attraction force that holds them together. On the atomic level, it’s also interesting that with water, visible light can travel through it. In other words, the swirling vortices of energy known as water molecules do not trap visible light. The vibration of these atoms allow for light transfer. Water is made up of oxygen and hydrogen. What about carbon? Well, as we all know, both diamonds and graphite are made of carbon and they have different transparences. Graphite is opaque, whereas diamonds are translucent. It would seem that structure has something to do with carbon’s ability to not interfere with a visible light wave (energy) for it clearly has the ability to not interfere with light when it’s in its crystalline form. This makes me wonder about sugar and more complex carbohydrates. Logically, at the atomic level, it would make sense that a plant would optimize its ability to store sunlight energy in a way that doesn’t interfere with storing sunlight energy. I mean, it makes sense that when a cell in a leaf is capturing the energy from the sun and creating sugar molecules that these new molecules would not interfere with the sunlight that’s passing through the cell. Cells that perform photosynthesis are three dimensional and if the plant created molecules that absorbed sunlight in a way that prevented the energy from being used ‘below it’ in the cell, that would be an inefficient form of storage for the plant. When we look at amino acids – the building blocks of the proteins in our body, they are predominately made from oxygen, hydrogen, carbon and nitrogen. The only new vibrational element is nitrogen. As it turns out, 80% of the air we breathe is nitrogen (nearly 20% oxygen). In this case, I would assume that nitrogen also has the ability to not interfere with visible light – which leads me to believe that it makes sense that protein molecules might be visible light transparent (to the greatest extent). As it turns out, most of the molecules that go into making up the body seem to not absorb visible light energy! Thus, when the cells in the body break down sugar to release the stored electromagnetic energy, that energy would be free to travel until is finds a vibrational energy that traps it. I keep coming back to the retina in the eyes with regards to how they twist when visible light energy comes in contact with it. Well, what if there are other protein configurations in the body act just like the retina – but rather then reacting to visible right rays from ‘outside’ the body – that are stimulated by light from within? What if the main stimuli in the body is light? It would seem that the body is streamlined with molecules that are both light friendly and light efficient. The more I look into it, the more I come to believe that light energy plays a very significant role in our lives. Yet, at the same time, are bodies are not transparent! At the non-atomic level, light can only travel a little way through our bodies before it’s absorbed. This same observation can be made with other ‘matter’. It would appear that as light enters a concentrated collection of vortexes, it eventually gets trapped and can’t escape. At this point, I’ve got to wonder if energy entering a substance actually feeds it? I’m still looking for a good theory that links spirit to light. Or, if it works the other way around, finding ways to link how light goes to make up spirit! For now, my belief that the science behind how spirit and ‘matter’ are linked seems to have made another step forward. I’m looking forward to having more time to investigate this union closer. For now, feed your light body and generate harmonic vibrations! Imagine the energy of the sun going into you. Came across this statement earlier today in the video that I’ve embedded below from Nathalie Lussier. Can you imagine the energy of the sun going into you? Seems weird if you think of it literally – as if we’re collected to the sun like plugging in the TV, but we are plugged in, yet indirectly (in most cases). The real trick though, is do we understand how we’re connected? Oh course there’s no scientific evidence in a lot of these things and mainly it comes from my own intuition. But eating a sun filled fruit, gives you the energy of the sun itself and when you eat it, you’re getting the sunshine inside of you. Which really is the truth. Have a look at her video and then let’s make some connections. Ok. Let’s start with the there is no scientific evidence part, for it appears to me that there really is sunshine in that fruit that she’s holding. Organisms need energy to survive. Some organisms are capable of absorbing energy from sunlight and using it to produce sugar and other organic compounds such as lipids and proteins. The sugars are then used to provide energy for the organism. This process, called photosynthesis, is used by plants and some protists, bacteria, and blue-green algae. For those that are chemical equation challenged, the items on the left of the arrow are the input and the items on the right are the output. Thus, 2 water molecules for every carbon dioxide molecule are reshaped, using the energy of the sun, into a sugar molecule, free oxygen and water (in equal amounts). If you’ve read some of my previous postings, you’ll know that I’ve wondered (out loud, in words) how the plant might be able to capture the sunlight and channel that energy into the new molecules. Well, I’m starting to get a better feeling for the process now. If you remember the article that I posted about how the retina of the eye work (The Art of Seeing, can you see auras? ), you’d know that light photons can empower molecules to twist. Effectively, the addition of a photon to a molecule creates a charge (like a magnet) that empowers the molecule to change shape. Also, you might notice that I’m reading The Biology of Belief by Bruce Lipton (and I’ve posted an article on that called Unlocking your DNA). He makes it pretty clear that molecules react to stimuli and that reaction could be as simple as moving head to tail to combine two molecules into something new. An example might be a protein molecule that in its un-energized state sits open and naturally attracts a water molecule on one end and a carbon dioxide molecule on the other. Then, like the retina, when energy is added, the molecule twists bringing the carbon dioxide and water molecules to touch. It may be that at the point of contact, the protein then releases the combined molecules after transferring the charge to this new molecule. Finally, the new molecule breaks free so the protein can go to work finding the raw materials to make more sugar. In any case, sugar is one by-product of the photosynthesis process. As you can see in the quote from About.com (above) the process also empowers the creation of lipids (fats) and proteins. Thus, to the plant, as long as it has the common building blocks, it’s able to construct what it needs on a cellular level by simply harvesting the sun’s energy. One thing that I find a little confusing about this process is that the scientists label, what I think of as a single type of energy, as solar energy and chemical energy. Don’t let that confuse you. I see it like this: the sun emits electromagnetic energy where the plants tend to capture specific frequencies in order to perform work. On the molecular level, that energy is transferred to the atoms to create high spins states, or states that change the attraction (or vibration) of that atom which allows for covalent bonds to form in stable molecules. Thus, the sunlight has been transferred to the molecules in the plant. Now, how does that help us? Well, our bodies are efficiently attuned to reverse the process. It’s like our cells perform anti-photosynthesis! After our bodies absorb and distribute the molecules to all the cells, it then reverses the process to release the electromagnetic energy. Scientists have been able to capture the released sunlight on film. I’ve blogged about it as Humans giving off light. Ultimately, the cells of the body break sugars (or other molecules) down in effect releasing (or absorbing) the light energy that the plants stored. The byproduct of taping into this energy is carbon dioxide and water, which complete that little cycle of life that sustains plant life. The coolest part about the unlocking of the stored sunlight is that the process releasing energy can be stored in proteins (or other molecules) with our body and used for various functions at later points of time. That absorbed light provides electromagnetic charges on the molecular level that make it possible for the proteins to be animated (move). Bruce Lipton goes into this in deal in his Biology of Belief lecture (of which, I’ve also blogged about here as Unlocking your DNA). So when you look at the process in the bigger picture, the sunlight (energy) flows from the sun to the earth and is captured by the plants. When the plants do this, they build the molecules that they need for all their cellular functions. The excess sunlight is used to spin up atoms (recharge them) and that newly charged atom finds a stable bond in more complex (simple) molecules like sugar. On a cold winter day, like the one displayed in the video, when we consume the plant life, that has the active stored molecules, our bodies are restored (reenergized) as our cells unlock the stored energy. So, as the winter progresses and if you find yourself not feeling your best, it may be that you’re not opening yourself up and accepting the energy of the sun. Now, the matter of getting cold are reverting from your raw food diet is a different story. Getting in touch with the natural rhythms of life might help. When the snow is falling, it would make sense that what we were able to store is what we should be tapping into while it’s cold. Dried food is the natural way of storing energy (rather than freezing) which also concentrates the calories. Maybe eating dried food is worth some investigation for I know that when I eat an orange, it tends to cool me down. In any case, there is science behind what’s said in this video. All you have to do is look. We are all 100 percent tied to energy. As long as there is a free flow of energy that we can tap into, we’ll function as nature intended us too. Is food another form of light? Not sure why it is, but there have been a number of people that have come into my life carrying the vibration of the diagnoses of cancer. Its eye opening to me; for the attachment that people have to that particular diagnoses seems to be extremely strong. It saddens me, for something so simple gets ‘treated’ is such an awful way by our current medical system. I feel it’s time for a change. So, I will state this up front – I am a firm believer that killing the body is a path that leads to death; not life. I am willing to bet that radiation treatment will be found to be barbaric and inhuman in the near future. The treatment for cancer is one of learning about light and life. By incorporating light, and the understanding that comes with it, the curse of cancer will be broken and the power of life will be restored and abundant! Part of breaking this ‘curse’ is through understanding. My studies have lead me through many different avenuies, but the truth that I’ve found all comes down to this very simple statement that I found on the ASH website (here). The drive that a person has to stay alive even in the worst of situations is so strong that this driving force permeates every cell of the body. Cells don’t want to die. There exist to serve and do whatever they can to provide that service. Even when we build an environment that deprives the cells of oxygen, they want to live so bad that they’ll revert to a process by which they will use fermentation to generate energy! I’d like to bring in nearly the entire article from the Advanced Scientific health website for I believe it’s so important that it should be read and understood by everyone. Here it is there article The Basics of Cancer. “Acidosis” is the scientific term for a body that has a pH below 7.0. In this state, the body is deprived of oxygen causing one to be more susceptible to colds, flus and other diseases/infections. This state also contributes to accelerated aging. Acidosis is the cause of America’s #2 killer-cancer. In order to understand the basics of cancer, we must first understand the acid/alkaline balance (see page 4). Understanding the acid/alkaline balance, the following summary makes perfect sense: The prime cause of cancer is the replacement of the respiration of oxygen in normal body cells by a fermentation of sugar. Warburg, in his Nobel Prize winning papers, described the environment of the cancer cell: A normal healthy cell undergoes an adverse change when it can no longer take in oxygen to convert glucose into energy. In the absence of oxygen, the cell reverts to a primal nutritional program to nourish itself by converting glucose through the process of fermentation. The lactic acid produced by fermentation lowers the cell pH and destroys the ability of DNA and RNA to control cell division. Cancer cells then begin to multiply without restraint [Italic added by me]. As I like to do, I’d highly recommend taking a closer look at what this article is talking about and, as it turns out, the information is readily available to anyone and everyone via your favorite search engine. The basic idea that this article states is that when a cell is deprived of oxygen (or oxygen is not available to the cell) the cell switches to a ‘backup energy generating technique’ that increases the lactic acid concentration (which is a byproduct of the energy generation process) that lowers the pH around the cell causing abnormal ‘growth’ and death of cells. That still might be a little complicated. Let’s look at why Oxygen is important to a cell and let’s also look at the fermentation process when Oxygen is not available. Cellular respiration (also known as ‘oxidative metabolism‘) is the set of the metabolic reactions and processes that take place in organisms‘ cells to convert biochemical energy from nutrients into adenosine triphosphate (ATP), and then release waste products. The reactions ducoda fields involved in respiration are catabolic reactions that involve the oxidation of one molecule and the reduction of another. Respiration is one of the key ways a cell gains useful energy to fuel cellular reformations. The energy released in respiration is used to synthesize ATP to store this energy. The energy stored in ATP can then be used to drive processes requiring energy, including biosynthesis, locomotion or transportation of molecules across cell membranes. So, this respiration process is the way cells generate energy and there are two distinctly different paths that the cells can take (if they are capabile of it like human cells): aerobic and anaerobic. From the Wikipedia about the Aerobic energy generating process. Make note of the fact that on the right hand side of the equation (right of the arrow which means ‘produce’) we get carbon dioxide and water when the energy is produced. Water is good for the body and carbon dioxide is normally exhaled on a regular basis. From Wikipedia about the Anaerobic energy generating process. Note here that this equation produces lactic acid and ATP. The ATP is the energy carrier, but the process produced lactic acid! So, lactic acid is a normal by-product of physical exertion. If you’ve ever worked out hard and ‘felt the burn’ that was the lactic acid buildup in the muscles. In time, in a normal health person, that lactic acid is removed and filtered out of the body. Now let’s look back at the original statement that sent me down this path. So, it would make sense that the cells in the body are not receiving enough oxygen and the body is not able to remove the lactic acid fast enough. Seems to me that the circulation system (lymphatic system) might not be performing up to snuff. Or, it could be that the blood is not carrying or doesn’t have the capacity to carry enough oxygen to the tissues. Or, it could be that process by which the cells receive oxygen might be blocked somehow. Overall, seems to me like someone that has cancer might be suffering from a breakdown in a number of systems – that can be easily repaired! Hemoglobin in the blood is what transports oxygen from the lungs or gills to the rest of the body (i.e. the tissues) where it releases the oxygen for cell use, and collects carbon dioxide to bring it back to the lungs. Hemoglobin is a protein structure that supplies the catalysts for aerobic activity. Also note that it’s specialized in removing the waste from the aerobic activity! It brings cells food and removes the waste. If you’ve read previous articles that I’ve posted (Is food another form of light? ), you’d know that the molecular structure of the hemoglobin is virtually identical to the molecular structure of Chlorophyll. Many studies have shown that the fastest way to build rich blood, full of hemoglobin, is to consume large amounts of chlorophyll rich plant matter. Another cool thing about Chlorophyll is that when the body converts the molecule into Hemoglobin, all it really has to do is remove the Magnesium and replace it with iron. Thus, not only will the person want to consume chlorophyll rich foods, but they’ll also want to provide foods that are rich in iron. Iron supplements are not the same as foods rich in iron. The molecules need single atom forms of minerals, thus taking an iron supplement that is not a single atom size will be treated as a toxin in the body rather than a food source. If you poke around on the internet at all, you’ll find that chlorophyll rich foods are mineral dense foods! The act of eating ‘green food’ will also provide essential building blocks for other key protein molecules and enzymes. Now, what about that lymphatic system? The Wikipedia has a nice little write up on that too. Even though the circulatory system is a closed system (or we’d bleed to death internally) it still delivers its contents to the cells in a rich fluid that slowly moves through the body. This is the interstitial fluid. If you follow the wikipedia link, you’ll see that it’s a simple osmosis process. This fluid is where the lactic acid is going to build up and be removed. This is also where all the other waste from the cells travel, including dead cells, until the body can either recycle them or eliminate them. This is also the fluid that feeds the cells. This is where the rich sources of ‘food’ are going to reside. This is where the nutrients that you eat end up in order for the cells to have access to them. Thus, the quality of food that you consume will be found in the space between your cells. Once again, I’ll reflect back on a previous posting Heat changes molecules for it’s a pretty well known fact that the act of heating molecules changes them. Cooking breaks molecules apart. The worst part about this is that when you digest food, the body doesn’t know that the molecules have been destroyed by cooking. Thus, the broken and disfigured molecules are absorbed by the body, travel to the cells and then find that they don’t ‘work’. At this point, the body has to go to the extra work of having to expell the molecules that it could never use. In a healthy person, this might show up by them getting a runny nose. In an unhealthy person, it may simply mean that they lymphatic system gets so overloaded that it takes days for waste to move through the system. On the positive side, the lymphatic system relies on muscular contraction for movement, it makes sense that a person should move enough to stimulate the movement of fluid, but not so much as to ‘feel the burn’ (which produces more lactic acid). The idea is that you’d want to keep the fluids moving along. A gentle yoga workout is great for this. A strenuous workout would only compound the problem by producing more lactic acid. Now, if the lymphatic system is sluggish, it would seem that someone would want to perform some type of detox. You’d think that because the colon is the biggest illumination organ, the first thing that you’d want to do is clean the colon! Next, because cooked foods create an abundance of broken and disfigured molecules, you’d make a conscious effort to reduce ingesting waste. In other words, don’t ingest anything that you do not feel will be utilized to its fullest. The last thing that comes to mind regarding the lymphatic system, is that this system is also where things are recycled in the body. In order to efficiently recycle things, the body needs the ‘workers’ to break things down so they can be reused. This is what enzymes do. If you revisit Heat changes molecules, you’ll see that it emphasizes enzymes. Enzymes are what transform the stored energy in seeds to the living plant. They break things down so that the cells can reconstruct things in new and useful ways. When you think about it, even if just a little, it’s easy to see that there are simple things that can be done to help the body perform its functions more efficiently, thus helping someone that finds themselves in a life threatening situation move towards a more normal condition. And, of course, think happy thoughts! Life is a journey that we all get to enjoy in our own special way. If you get to the point where your cells fight to keep functioning and it looks like cancer, it’s just your body telling you that the choices you’ve made might need to be re-evaluated – quickly! The way I look at it, when cells act in a cancerous way, we have to realize that we’ve created an environment where oxygen can’t get to the cells so they are doing what they can to keep YOU alive. It’s up to YOU to realize this and do what you can to KEEP THE CELLS ALIVE by feeding them oxygen! It seems silly to kill the very cells that are struggling to stay alive when all they want is oxygen and to not sit in their own feces. Time to get back to relaxing. Maybe you should too! Oh my! If you think it’s hard enough keeping your hands out of the cookie jar, wait until you try these truffles! With a snap of the chocolate exterior, the creamy filling explodes with flavor on your tongue filling your mouth with sensations that exceed anything Hershey’s puts out! 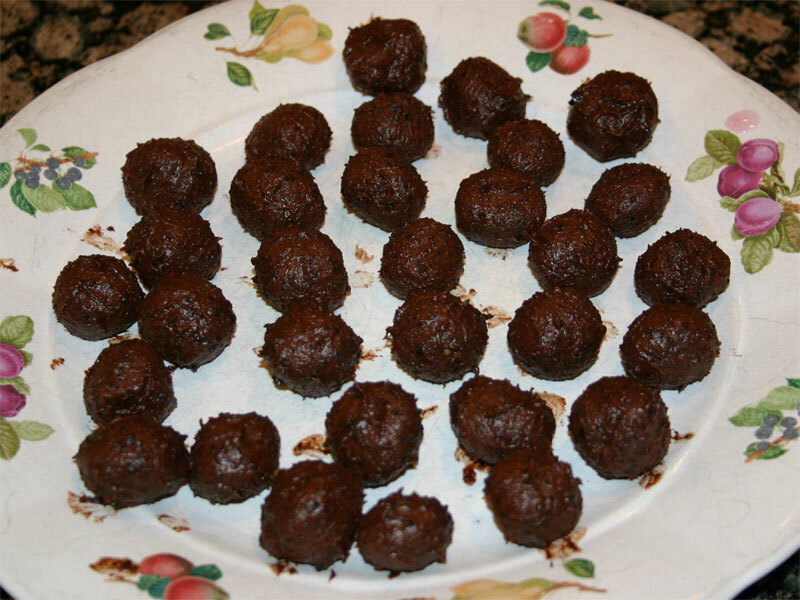 Everyone that sampled one of these truffles was as impressed as I was with the flavor and more amazed by the thought that I actually made them – and they are nearly 100% raw, dairy free and amazingly professional! Yep, that’s a small sampling of the overall collection. Overall, the two batches that I made rolled out to nearly 70 truffles. Don’t they look amazing? They’ve all got little flat spots on the bottom where the chocolate hardened and you can even see the vanilla powder (little black spots) that didn’t completely dissolve in the cacao butter. Yet, I have to say this is one of the best ‘Christmas cookies’ I’ve ever made! And they’re actually pretty simple to make. The hardest part for me was to figure out what to put on the inside. A typical truffle has some creamy diary-butter-sweet filling with some simple flavor, but in the raw, dairy free world, you’ve got to search a bit to find something that comes close. After searching the net and reading a number of different raw food blogs, I decided on coconut oil, almond butter and some fruit. 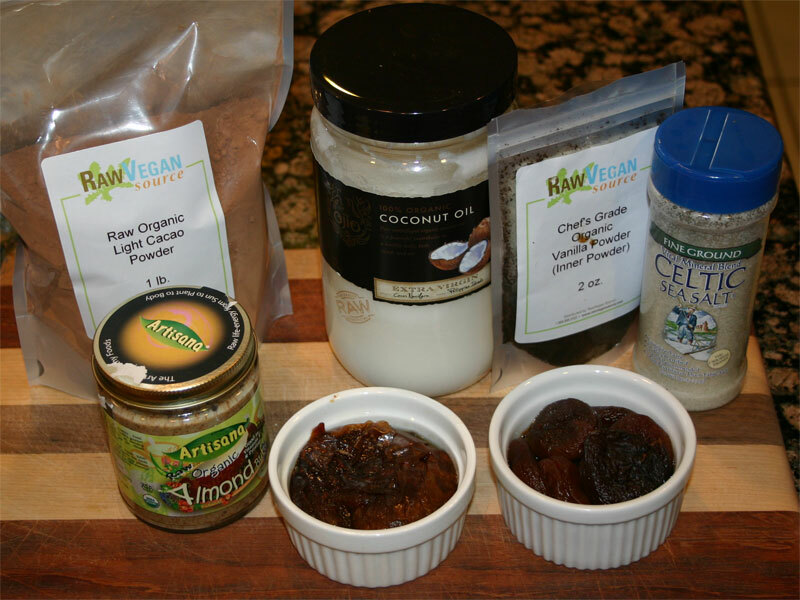 I figured that the fruit would provide the sweetness, the coconut butter would provide the creamy feel and the almond butter would provide texture and substance. As it turns out, that combination makes for a really nice base! So, if you’re ambitious, here is what I did. Look closely at the two pictures above. They are slightly different. One contains Apricots and the other blueberries and Amaretto. It’s funny looking at these pictures now, for I took them before actually working up the ‘batters’ and I added the amaretto to the apricot mixture rather than the blue berry one. In any case, everything that I used for the filling is shown. ¼ cup the finest dried blueberries you can find. Note that I started making these truffles on Friday night and finished them late Sunday evening! I takes a while but I’m sure you’ll be able to streamline the process. Here we’re going to prepare the fruit. Select the best Medjool dates and other fruit and place them in a little bowl with just enough water to cover them. The idea is you want to reconstitute the dried fruit just enough to soften it up, but not to add so much water that the filling becomes soupy. Notice the little bowls that I used. 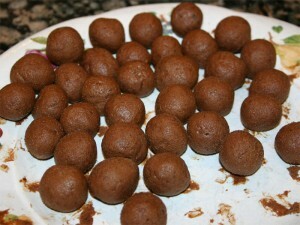 I removed the seeds from the dates, pressed them into the bowl and then covered them with a couple tablespoons water. The blueberries I simply measured out and covered with water. The apricots were a little harder because they are naturally… well…. Hard. I used a bit more water with them. 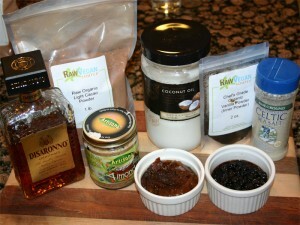 Time to get out all the basic filling ingredients and along with your favorite blender for we’re going to fill it up. It’s just a matter of placing everything (but the water) in the blender. Remove the dates and add. Remove the apricots (or blueberries) and add. Shovel in the almond butter, coconut oil, cacao powder, salt and amaretto. When it’s all in, turn the blender on its lowest setting. With my Vita-mix, I don’t need the lid on when it turns on its lowest setting. This allows me to work the batter. If you’ve ever made date paste, you’ll know it likes to clump up. You’ll want to work it down into the blades and get the entire mixture to turn. As you can see, it’s pretty rich. Some people like to add liquid coconut oil, but I simply added it hard. That might make a difference and I’ll try liquid next time. Notice the position of the vita-mix spatula. If you look closely at your blender, you’ll see that the blades to not reach all the way into the corners. Thus, on that lowest setting, I was able to place the spatula all the way down in the corners to help the mixture turn. When it started turning, I would work the speeds up to 5 or so. The idea is that you’ve got to work it long enough to really break up the fruit and make the mixture ‘creamy’. 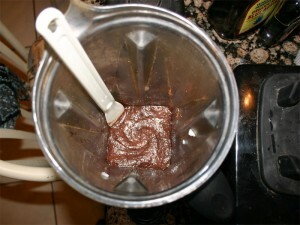 When its mixed thoroughly, empty the contents of the blender into a container and place it all in the fridge to cool. You’ll want to get it cold enough to shape. 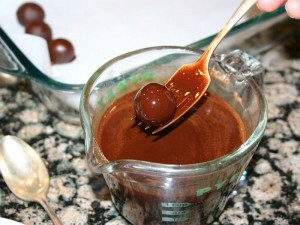 After it’s cooled, use a spoon to scoop out the semi-hardened mixture and do your best to work it into a ball. This will take some patients. The coconut oil liquefies so quickly that you’ve got to move fast and make very little contact with what will be the truffle filling. Notice how old shaped they are. They’ll stick to anything and everything! When you’ve gotten through the entire batch, place them back in the fridge to harden again. I just placed the entire plate in and let it cool completely. Using a large pottery plate will give you a little more time because it takes longer to heat back up after removing it from the fridge. Notice how the second roll knocked down the points and made them all nice and round. Unfortunately, they will warm quickly so you’ll have to cool them again. At this point, placing them in the freezer just might be an option. I did for a little while, but I didn’t want them to freeze completely. I just wanted them to get really cold while I prepared for the next steps. Here is where we revisit any old raw chocolate making recipe (or this recipe). Well, ok, not just any! Here I’ve melted the cacao butter to the point where it’s ready to mix. Note that to get it to this point I measured out 6 ounces cacao butter, shaved it into the pyrex measuring cup and then placed it in the dehydrator. It takes a few hours to melt, so I started early in the process. Note that there is just about 1 cup cacao butter in its melted form. To that, you add the cacao and vanilla powder. 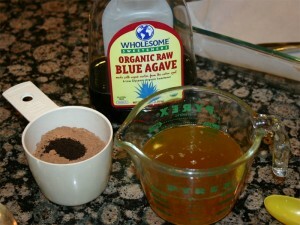 After mixing that well, you add the agave. Like any good oil, you’ll find that the other liquids are going to want to sink to the bottom, thus during the dipping process, you’ll have to stir it regularly so the sweetener get evenly distributed on each truffle. Now comes the dipping process. The liquid chocolate in the measuring cup is 90+ degrees and so you’ll have to move fast, yet, the dipping process takes time as you wait for each layer to dry. Be prepared to watch paint dry for a while! 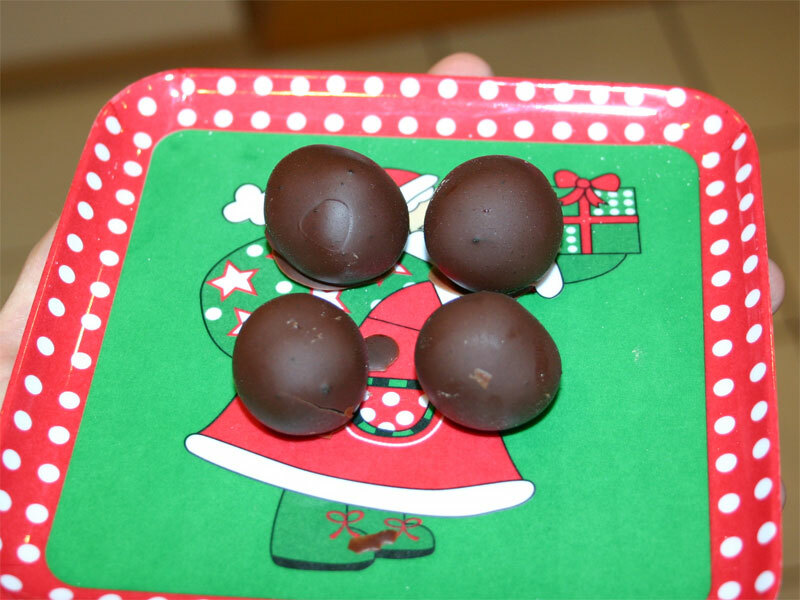 I prepared a pan with parchment paper to receive the finished truffles. Then I removed the very cold rounds from the fridge and started dipping. As you can see, I used a fork to hold the cold filling for dipping. Because the filling is cold the liquid chocolate will cool and harden in a matter of seconds. Thus, I’d dip it just long enough to cover the filling and then hold it above. After a few seconds the chocolate would harden and I’d dip it again. For each truffle, I dipped it three times. After the last dip hardens across the top of the filling, I’d gently work it off the fork (using a butter knife) onto the parchment paper. After dipping them all, back into the fridge they go to cool one more time. When it’s all said and done, you’ve got these! Before serving, take them out of the fridge and let them warm to room temperature. The chocolate shell will remain relatively hard, but the coconut, almond butter filling will nearly melt. Thus, when you bite into it, you get a snap from the hard dark chocolate and a somewhat runny feeling from the center which always surprises the person to no end! I can’t wait to mix up the fillings. If I were to choose just one of the two filling that I made this time, it would be the apricot filling. There is something about blueberry seeds that gives the mixture an off flavor. Don’t get me wrong, the blueberry filling is really good, but the apricot one is simply better! Also, next time I’ll probably use less dates and more of the other fruit. For instance, I’d use two dates and 12 apricots, or 2 dates and ½ cup blueberries. In a way, the fruits where overpowered by the dates. Next time I’d want the individual fruit flavors to stand out better. Overall, this is exactly what I’ve been looking for! This is how you wow people with just enough chocolate to make it fun, but not so much as to break the bank! The fillings are ‘real food’ thus it’s more a decadent taste sensation then a toxic curse. Lol. Remember to make them small for there is a LOT of flavor in each one. The alternative is you’ll be running extra miles – if you’re not careful. There’s magic in the air; every day, all day. It’s everything that you’ve imagined and more! The best part is that it’s free for the taking! Step up and check out, it will not be long before you experience your next miracle. As some of you already know, I spent the better part of the last weekend at a Matrix Energetics Seminar. They called it a Level 1 and 2 weekend with a follow on Practitioners session (on Tuesday). Beforehand, they perform a free intro for two hours on Friday night. There’s definitely a lot of show, but there is real content in the mix. In my case, I would definitely have to agree. The money you’d spend on this show would only get you through a few treatments with a psychiatrist, yet you’ll find answers to the problems in the show that I’m mostly positive that you’ll NOT find with the psychiatrist! Nope. Radically different – to the core different experience. Not today. What he teaches could be condensed into a half day seminar, but the real meat of the program is in the ‘playing’. Nearly half the seminar is play time and during that time, 80% of the time is spent not playing because people have such a hard time … playing! What’s the most important teaching? Every moment of every day could be spent playing. There is no limit to the enjoyment that someone can tap into if they so choose. And, as it turns out, this is what I took away as my ‘homework’ – Play more. Many years ago, a beautiful lady felt sad for me because I have always taken everything so seriously. She said ‘you need to play more’. Those words have stuck with me like a shimmering spell just waiting to awaken. The problem is that I’ve always been conflicted by the statement because I didn’t understand the act of playing. You see, when ‘normal’ people think about playing, things like going to the bar, joining a soccer team, following your favorite NFL team or playing video games pretty much makes up the collection. No matter what you name, the ‘games’ people play – to pass time – just don’t rock my boat. I love learning. I love discovering the truth. I love creating. I love it when someone asks me about the things that I’m passionate about – and then listens! I love being with people that have similar interests. I love feeling the passion when another person shares what they love about something. Well, it didn’t take me long to discover that the 500+ people that attended the seminar made me feel like a pea in a pod. Lol. I met massage therapists, clairvoyants, musicians, doctors, hypnotists, hippies, software engineers, Matrix Energetics practitioners and more. It was a very interesting collection of right brained people making associations between what they experience and what they know. It felt like I’d found a home that almost felt like home. I have to admit that Richard wasn’t the most interesting person there. But his teaching style is effective. I guarantee that you’ll never forget how he tells his stories or how he demonstrates the magic. The people that you met in the practice sessions are probably more profound for these are the people that you actually make ‘connections’ with. These are the people through which you experience the magic. What stood out the most? The people that attend the sessions like this are people that are conscious about spiritual energy. They have experience channeling and focusing energy. Thus, the moments where everyone in the room came into harmony (at the same time) made for intense experiences. These harmonic sessions happened quite often. There were also times when Richards own life lesions radiated through creating disease, breaking down the harmony that he’d (un)consciously built up. These moments were something that I clearly noticed and when I mentioned it to a few people they confirmed it right back. The harmonic moments are so desirable that in the end the un-harmonic points (which feel more like reading bad news) just fade away. I was also stuck by the clarity of his statements that he doesn’t know what he’s doing. After participating for four days, I’m left with the impression that he acts like a ten year old and he’s really (to the greatest extent) unconscious of what he’s doing. In a laughingly way, this is supported by the unconscious experiences that people have in his presence. It’s really amazing. I’m absolutely sure that his child like behavior is what helped him discover the magic that he teaches. It’s a beautiful thing that I’m sure will be expanded upon (by others) in no-time. I would love to attend another seminar like this, but it would have to be one where the inharmonic moments are removed and they bring in conscious language and intent. Richard constantly stated that he didn’t know what’s going on. A common statement came across like “I have no idea what just happened!” Each time I felt him state one of these statements it made me sad for he could have opened himself up to the truth and the answer would have been as plain as day. In the end, though, my biggest take away is that it’s time for Dave to come out and play. I have finally found a ‘game’ that interests me. I’m totally looking forward to developing a ‘practice’ and playing with others in ‘games’ of our own choosing. So the challenge is out. If you want to join me, bring an open heart and we’ll make up games to discover the truth together!